The call was made in an email circulated to 44 lawyers and law firms and one other professional on Thursday, February 3, and signed Kay, Kay Bacchus-Browne Chambers. The email also called on all lawyers to speak out and be heard on the recent amendment to the Code (Criminal Procedure Code) and the proposed abolition of Section 51 (3) and (4) of the RPA (Representation of the People Act). âWe cannot be afraid to speak out. There can be no justification to repeal Sec 51 (3) + (4) of the RPA except to save the accused parliamentarians who have been charged. Can we as lawyers remain silent? Are we mice or lions?â, the email said. The email also disclosed that the private criminal charges which had been brought against Afi Jack in December 2010, had been discontinued by the DPP on February 3, the day before the case was scheduled to be heard in the Magistrateâs court. Jack had been charged with unlawfully re-registering in the lead up to the December 13, 2010 general elections. âI have the evidence for you to peruse if you wish. It is time to call for the DPPâs recall! Stand up and be counted all of you,â the email said. 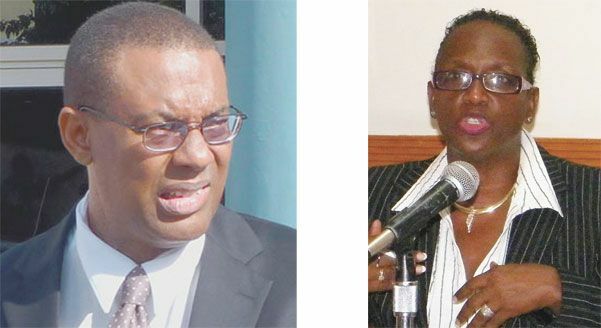 However, DPP Williams has defended his action, and said on a call in programme on WE FM on Sunday, February 6, that his office conducted its own investigations, in addition to the statements provided to his office by Kay Bacchus Browneâs Chambers. He said based on their investigations, they discovered that there was no basis on which a charge against Jack could succeed. The DPP also told SEARCHLIGHT that a statement obtained from the Supervisor of Elections said that no objection was made to her about Jackâs re-registration and that she authorized the transfer. âThe law is clear,â Williams told SEARCHLIGHT. In relation to the calls for his removal, Williams questioned why the Bar Association has not called a meeting for the last two years. Williams also said that since the last Bar Association election in 2008, no further elections have been held. âDo we have a Bar Association then?â he quipped.